Last night at The Whisky Exchange’s Bowmore tasting, we were treated to 90 minutes of real education from Bowmore’s brand ambassador and Master of Malt Iain MacCallum (who describes himself as a “professional travelling alcoholic”), and we got to taste (and pre-order!) 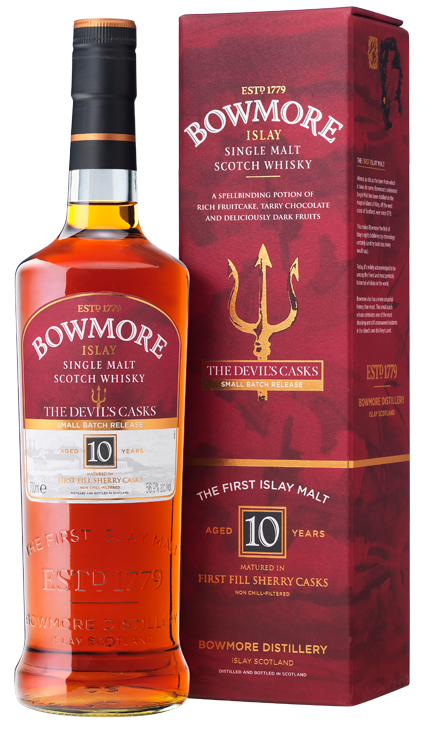 Bowmore’s fantastic new expression, Devil’s Cask, which is a real belter (a sherried Tempest). While sea levels are rising, Scottish whisky archives are safe because Scotland and Finland are rising faster than sea levels due to the vagaries of plate tectonics, while England is sinking. Another reason to move to Scotland forever. Whisky blenders (apparently) say that Bowmore is the best balanced Islay whisky; not too peated with a balanced fruity or floral character. I have to agree from this tasting, all of the expressions were very well balanced. Creamy vanilla on the front of the palate indicates use of north American oak (trees that grow tall with all the foliage at the top of the tree near the sun). Tannic richness at the back of the palate indicates European oak (trees that grow foliage closer to the ground to shelter from the storms and weather in Europe). A salty tang at the side of the mouth usually indicates a coastal distillery. In younger peated whiskies, the smoke is more prevalent and leads the palate. By 17 years old, the smoke and fruit aspects from the wood pass and the whisky starts to become more dominated by fruit and floral flavours. Fantastic standard whisky from Bowmore with great balance. I nearly bought a bottle of this but was seduced by the Tempest. Nose – Creamy vanilla, light peat, pineapple. A delicate hint of savoury smoke, beautifully balanced and very enjoyable nose. Body – Wooded, bold, citrus flavours, salty, very interesting. Finish – Creamy mouthfeel, long and rolling salty finish, long peat ending. Very good. 12 years in bourbon followed by 3 years in Oloroso sherry casks makes this the darkest Bowmore. Iain described this whisky as the “sorbet of the whisky world” – a palate cleanser, due to its dry, short finish. Nose – Sweet, plastic, tropical fruit, pineapple and melon. Body – Fine, salt, bookcase, lots of cumin and bold smoke flavours. Very interesting, not as balanced as the 12yo. 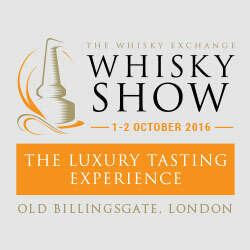 A vatting of two whiskies – each spending 18 years in either bourbon or sherry casks. A very fine, balanced whisky. Nose – Sweet fruit, beautiful oak and dusty bookcase, very interesting and approachable. Body – Iain said it “dances on the centre of the palate” which is true. We were all doing a lot of agreeing with him by this point in the tasting. Salty and brined, fresh, refreshing and very well balanced smoke and dark fruits. Finish – Smokey, medium length finish. Very delicate and well balanced, a beautiful whisky. An expensive, extremely smooth whisky. Beautifully made and dominated by a palate and finish of Parma Violets. This is apparently due to the distillery using the waste heat from the distilling fires to heat an attached swimming pool for the local community in the late 80s. The extra heat experienced by the whisky caused different esters to form and 25 years later, these flavours have come to the fore as Parma Violet taste. Once it was pointed out I found it a bit off-putting! Nose – Robust, marker pen, and very fruity. Earthy notes with stunning integration and balance. Body – Smooth, bananas and peach, Parma Violets and new car. Finish – Very long finish, very smooth, long Parma Violets. A bit too smooth and not the same level of fruit as the Tomatin 30yo against which I must judge it, given that it costs £100 more. A rollercoaster of a whisky, this is the one I came home with. I’m a sucker for big, peaty, coastal whiskies when at tastings but I’m less good with living with them, so it remains to be seen whether I’ll come back to this as often at home. Nose – Swimming pool, new plastic, toast, coastal brine. Body – Explosive mouthfeel, massive body, loads of oak and salt but beautifully integrated. Remarkable. Finish – Long, smokey, toasted finish, aniseed balls. This is the new Bowmore expression which will be released in October 2013. Described as a sherried tempest, the whisky is matured in 100% Oloroso casks and should sell for the same sort of price as the 15 year old Darkest, so around the £50 mark, which makes it an essential buy. I have one on pre-order with TWE. Nose – Fanastic fruit, dark fruit – prunes and sultanas. Body – Massive sherry hit, plastic, bold smoke, amazing that it works so well together, stunning. Finish – Long, toasty, ash. Beautiful integration and great oak. A dark, savoury whisky with a great port aroma and loads of character and cream, but very expensive. Nose – Sweet, savoury, beautiful and fresh with an edge of peat. Body – Amazing, creamy, toasted with incredible integration. Stunning. Finish – Long, savoury finish, rolling and changing. 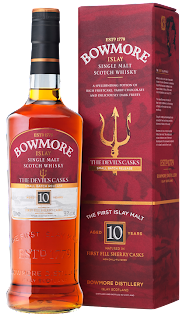 It was a fantastic tasting – really good fun and informative, and Bowmore have a great range with nothing sinking below an A for me. The posh whiskies I’m not too excited by here, it’s the younger and more innovative whiskies that really showed their talent. The Tempest came home with me (as did a miniature of the 15yo darkest that they gave away), the Devil’s Cask I’ll be picking up on release, and the 12yo goes on the list of whiskies to come back to soon. What a great night, the only problem was I wanted to carry on when we got to the end of the tasting!